Dong Ting Bi Luo Chun is one of China's Ten Famous tea and regarded by many as second only to Xihu Long Jing. This tea was created in Ling Yuan Temple of Bi Luo Peak, Dong Shan and was orginally called Xia Si Ren Xiang, which generally means "astounding fragrance". It was the Qing Emperor that gives it its name, Bi Luo Chun (named after Bi Luo Peak) and declared it as an Imperial tea. Dong Ting Shan is now a protected area. Only the leaves picked within Dong Ting West and East areas can be considered as Dong Ting Bi Luo Chun. This tea is certified organic by COFCC China. Pour in the hot water first before putting in the tea leaves. The first infusion is strong and has a lasting aftertaste. Second infusion features a more complex shifting fruity, flowery and nutty notes in the taste. 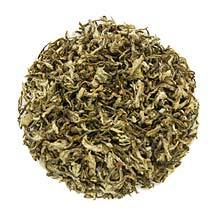 Beautiful tiny, slightly curled tea leaves covered with white down. The liquor is bright yellow in color.